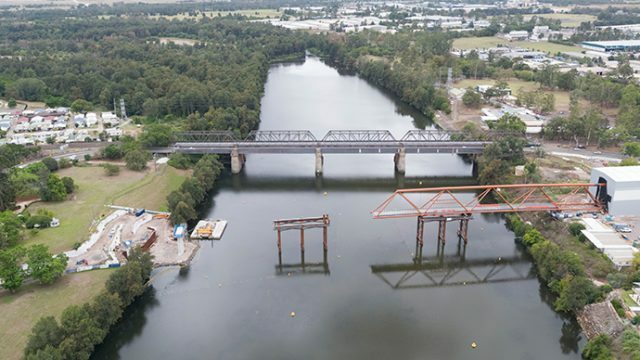 Work is ramping up on the Nepean River Bridge with another major milestone achieved as the structure reaches halfway across the river. Penrith MP Stuart Ayres said the Penrith community will soon be able to enjoy the new pedestrian and cyclist bridge, with more than 70 per cent of work now complete. “Crews have already completed four launches to get the bridge to its final destination and this launch marks the halfway point across the iconic Nepean River,” Mr Ayres said. “The bridge is now 100 metres across the Nepean River and still has 100 metres to go before it reaches the pier on the western side of the river. As the segments are pushed across the river, crews are still working behind the scenes in the temporary workshop to put the remaining bridge components together as well as weld and paint the steel to form the main span of the new bridge. “Once the new 200 metre long pedestrian bridge reaches the western side of the Nepean River, crews will then install railings and lighting,” Mr Ayres said. “Next month steel girders for the approach span on the western side of the river are also expected to be lifted by crane into position. This work will be carried out at night to minimise any impact to motorists.